While inspecting my garden today I ran across some very cool looking structures on the underside of a leaf. I could tell immediately that they were lacewing eggs. The thin stalks each holding up a tiny white egg on its end was a dead giveaway. The eggs are held up on thin stalks about 1/4″ to 3/8″ tall. Lacewings are a good ally to have in your war against insect pests because they are a major predator of aphids and other soft-bodied insects like mealy bug, mites and even small, newly hatched caterpillars. It is the larva stage of the lacewing that terrorizes the other small insects, especially aphids. 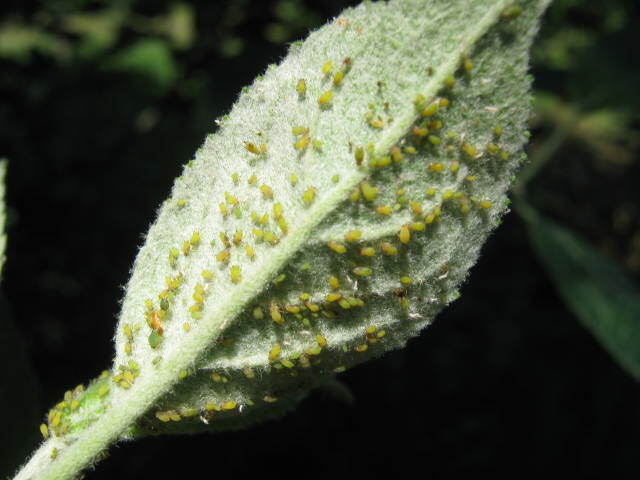 If left alone, aphids can rapidly overwhelm a plant by sucking the juice out of a plant’s leaves and stems. Lacewings eat so many aphids that entomologists have nick-named them “aphid lions”. A single lacewing larva can eat over 200 aphids a week. The adult on the other hand, eats only nectar and pollen. Depending on the weather conditions, the lacewings will stay in the larval stage for about two to three weeks devouring small insects all the while. When the time is right, they then spin a cocoon and emerge five days later as an adult. The adults mate and the females lay their eggs on the underside of a leaf. About four or five days later the eggs hatch and the cycle starts over again. Watch for lacewing eggs on your plants and avoid spraying insecticide when you find them. Let them do their work and they will reward you by building up their population and eating even more insect pests. Earlier this week I spotted some small, white butterflies flitting around in our garden. They were the easy to recognize adult stage of the imported cabbage worm larva. Now, a few days later,their larvae are voraciously eating our cabbage. Curiously, I haven’t seen any on the broccoli or kale yet, but they will show up there soon too. 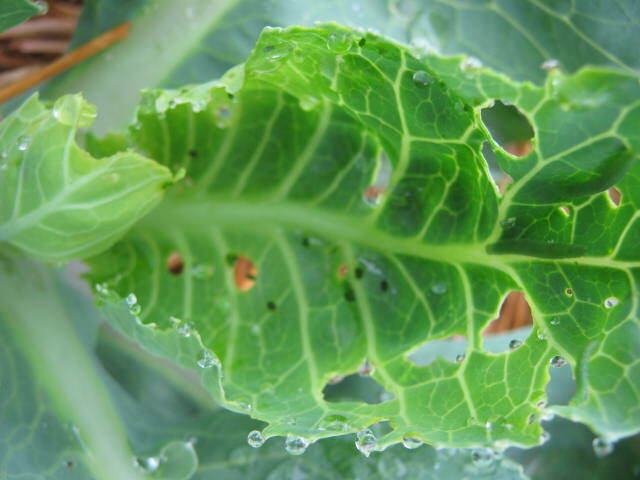 These pests eat any and all plants in the cabbage family including broccoli, cauliflower, kale, turnip and rutabaga. They are said to attack radishes as well but I’ve never seen it in all my years of gardening. Maybe it’s because our local population would rather eat the other plants if given the choice. 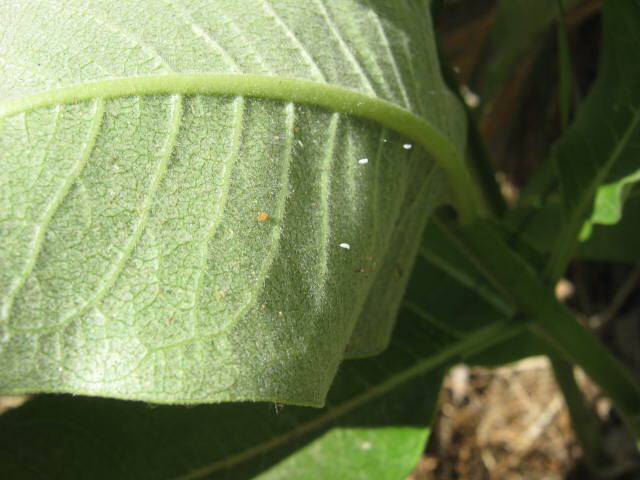 Holes in the leaves and frass, caterpillar droppings, are typical cabbage worm signs. BTW, it’s not the baby caterpillar that makes the choice what to eat, it is its mother. The female butterfly flies all around looking for the ideal spot to lay her eggs so her offspring have the best food to eat. That way they can grow up to be big and strong and healthy. That is good for the cabbage worms but can be disastrous for a garden. Farmers know that within days a few cabbage worms can chew so many holes into a cabbage that it will be unfit for market. Even in a home garden cabbage worms will ruin large portions of a cabbage. Within a few days this young cabbage worm will quickly grow and eat large volumes of cabbage plant parts. There are a couple of different species of cabbage worms in our area, one is the imported cabbage worm, the other is the cabbage looper. They are both green and color and do the same damage. Imported cabbage worms are very slow and sluggish when they move. Cabbage loopers move along like inch worms. 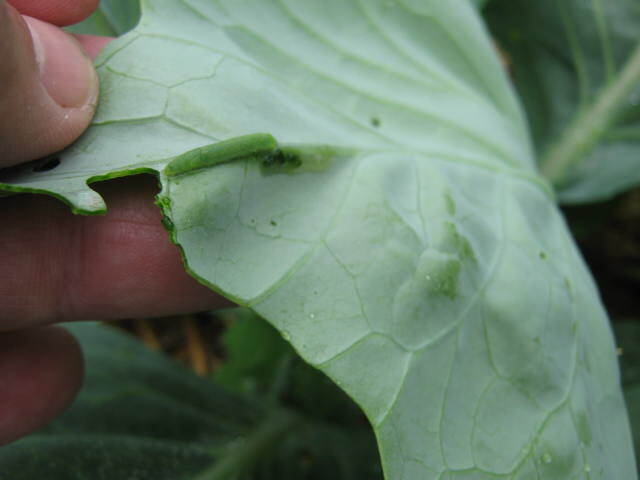 Both species of cabbage worm are easily controlled by insecticides labeled for chewing insects on vegetables. Bacillus thuringiensis, or Bt, is a favorite worm killer among organic gardeners. It is made up of spores from a bacteria that infects only caterpillars and is harmless to other insects. Controlling them now while they are still small is much easier than waiting until they get bigger and really start chewing away large chunks of your crop. We’re seeing the first flea beetles in the garden this season. These tiny pests can cause a lot of damage to small plants if they’re not knocked back early on. 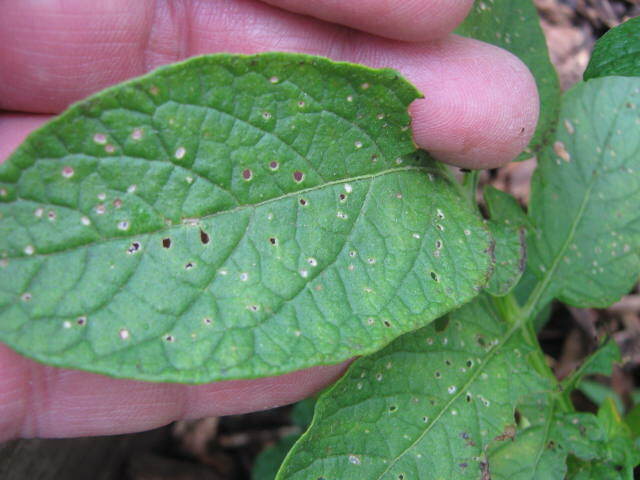 Usually the first thing you see when flea beetles enter your garden is the distinctive chewing pattern they make on the leaves and not the beetle itself. Flea beetle damaged leaves are riddled with small holes. Imagine what would happen if a garden fairy took its tiny shotgun and blasted away at the leaves, that’s what flea beetle damage looks like. The beetles themselves are black and less than 1/16″ long. They sometimes will jump, sort of like a flea, when disturbed. Like many insects, they have their favorite foods. In our garden eggplant and potatoes are the first to be gnawed followed by tomatoes then all of the other vegetable plants. Numerous small holes are indicative of flea beetle damage. Vigorous plant s are usually able to shrug off a flea beetle attack. The greatest danger to the garden is when the plants are small and growing. At that young stage flea beetles can stunt or even kill plants. As the plants get larger, they can sustain much more feeding by the beetles. Fertile soil and timely watering will help plants stay healthy and grow past that vulnerable stage. A homemade concoction made from garlic and hot peppers will fend off the beetles for a while. Take a half dozen cloves of fresh garlic and crush them up. Add the garlic along with a tablespoon of dried, crushed red pepper to a quart of water. Let it steep for a couple of days. Strain the mixture. Spray it onto your plants every three days or so to chase away the flea beetles. If you have a really bad infestation or a big garden, you can use any garden spray or powder that is labeled for killing beetles in the vegetable garden. Organic gardeners can use that old stand-by rotenone. Pyrethrum or spinosad, both considered organic insecticides, are good too. One major job in the garden this week is thinning our vegetable seedlings. It’s one of those things that is hard to do sometimes. Plucking all those little seedlings after waiting so long for them to germinate seems drastic but it needs to be done. Most of us have no compunction when taking out weed seedlings but have very mixed feelings when it comes to removing vegetable seedlings. After all, we paid good money for those seeds and now we’re going to pull them out just as they are getting going? 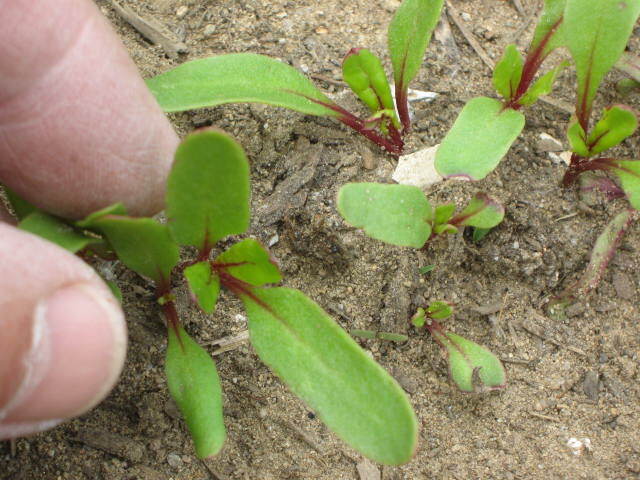 Beet seedlings are easy to transplant after thnning. When growing too close together, vegetable seedlings compete with each for nutrition, water and sunlight just like weeds. Over crowded seedlings will grow and produce but will never live up to their full potential. Gardeners who have never thinned vegetable seedlings before are often shocked at the improvement that happens the first time they thin. Vegetables are larger in size, better quality and have a higher total yield. Seed packs have information printed on them that give final plant spacing which is very helpful to beginning gardeners. Experienced gardeners are able to estimate spacing by envisioning the plant when it is full size, then leaving the right amount of space between seedlings. Most thinned seedlings can be transplanted to another part of the garden, the exception is carrots. A carrot’s shape is determined by its main taproot. If the root gets bent during the transplant process, the resulting carrot will develop that shape defined by the bent root. Weather conditions in the Pacific ocean always have an effect on our weather here in the Great Lakes area. Because of changing conditions in the Pacific, the National Weather Service is predicting a warmer than normal summer with normal or slightly below normal rainfall. That means as gardeners, we may have to irrigate our gardeners this year if we want to maximize our vegetable yields. There are many ways to water a garden. Some are very inefficient uses of a gardener’s time and effort such as carrying watering cans. Other methods are inefficient by wasting water such as spraying water into the air with a sprinkling system. 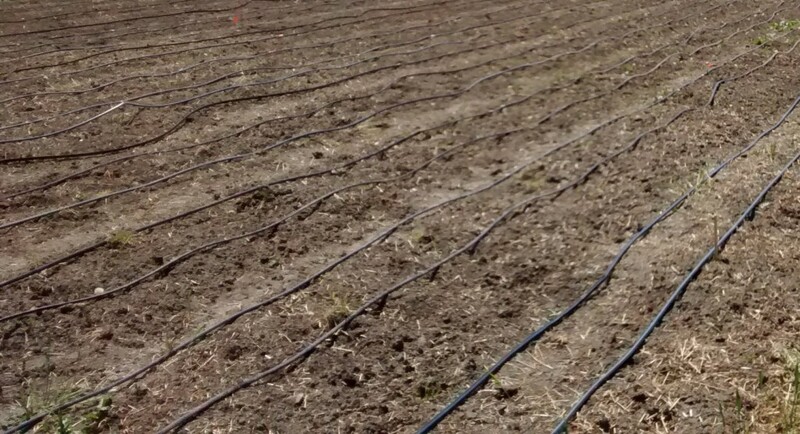 The most efficient way to irrigate is to use a trickle or drip irrigation system. The simplest way to describe a drip system is to imagine a flat, thin-walled hose with tiny slits cut into it at regular intervals. Those tiny slits allow water to slowly drip out of the irrigation line rather than spray out into the air. Unlike other types of irrigation that wet the entire soil surface and rest of the garden from top to bottom, drip irrigation places water only where it is needed, at the root zone of the garden plant. As water drips out from the irrigation line, it travels straight down onto the soil for a short distance. It then begins to spread out providing moisture to the area of the soil profile where the plant roots are. Install irrigation lines before or shortly after planting before the garden plants get too big and in the way. Looking at an area irrigated by a drip system, the soil may appear to be dry with just spots of moisture at the perforations. Underneath however, down in the root zone, moisture spreads out horizontally becoming available to the entire root zone. Soil texture affects the shape of the moist area somewhat. In sandy soil, water will travel further down into the soil before beginning to spread out compared to loamy or clay soils. A dry soil surface also means fewer weeds since weed seeds need water in order to germinate. Drip irrigation keeps the plant leaves dry giving plants some protection against diseases since many plant diseases can spread when leaves are wet. That’s why so many Golden Delicious apples come from the state of Washington. Out there very little rain falls and the air is dry — too dry to support plant disease. A drip irrigation system provides all the water the trees need. That is the perfect combination of growing conditions to minimize plant disease and maximize apples production. Here in Michigan our farmers grow wonderful apples but it is more difficult for them to do. A battery-powered automatic timer coupled with a valve system makes watering your garden a virtually hands-off process once it is installed. It also takes the worry out of leaving your garden to fend for itself while you are away on vacation during the hottest part of the growing season. With care during installation, removal and storage, irrigation lines can be used over and over again year after year. A warmer than normal growing season coupled with an efficient irrigation system will produce a bumper crop of garden vegetables this year.